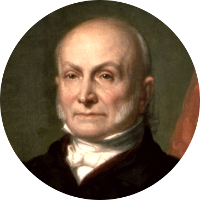 John Quincy Adams was the 6th President of the United States. The first of the father and son presidents, his father was John Adams Jr., the 2nd U.S. President. The family tree of President John Quincy Adams is filled with famous kin via connections through both his mother and father. Through his father John Adams, he has a number of connections to important historical figures such Mayflower passenger John Alden and Declaration of Independence Signer Samuel Adams. His father also has presidential connections to President Calvin Coolidge and President Millard Fillmore and a rather close connection to Hollywood movie star Raquel Welch. Through his mother Abigail Adams, John Quincy Adams has numerous kinships to presidents, royal family, and historical figures. President Theodore Roosevelt and President Franklin D. Roosevelt are just a couple. Also both Prince William, the Duke of Cambridge, and Kate Middleton, the Duchess of Cambridge, have kinships to President John Quincy Adams.